No matter your form of travel, whether it's via plane, bus, or even metro, I wish you & yours safe travels and a blessed Easter Celebration. The above picture is one of the finalist for the Peeps diorama entries hosted by the Washington Post. 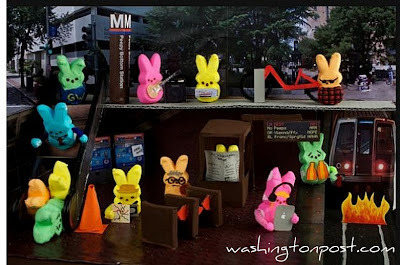 This diorama captures everything that is crazy/unique/annoying about DC's fabulous metro system. I love every single detail. From the station manager reading his paper, to the sign board stating the next train is never going to come. (Which be the case sometimes!!) Locals fondly recall when the escalator malfunctioned at Dupont and look at the tourist hogging up space reviewing the map. I can't even be mad. I was once a tourist. Heck, I still am! If you want to see more diorama entries, check out the Washington Post's slide show here.